Biggest Grill Cabin 25m2 of ours invites you to pleasantly spend your weekends, celebrate holidays with a large group of friends, organize events or get-togethers of your relatives. It will easily fit about thirty people. Huge space, delicious grill steaks and fire heat will create the best mood for smaller or bigger celebrations. High-quality materials ensure the longevity of a grill house and easy use. 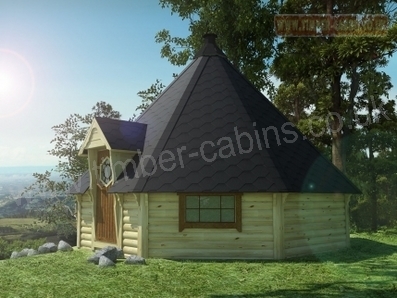 Eight cabin walls are made of rounded spruce boards with the dimensions 45 x 145 mm. A roof is covered with bitumen shingles (different colors can be selected), and there are four double glazed windows, two of which open. Besides that, doors are decorated with an original hexagonal window. Also there are seven benches in the cabin; two of these benches easily transform into holding benches: just turn over the additional board. Floor is easily assembled from separate components. There is a convenient wood- or charcoal-fired grill with a table around it inside the cabin. Also one adjustable cooking platform and two special platforms for a kettle, frying pan, etc. can be found. Above the grill there is an adjustable chimney. Finally, the cabin is lockable, and there is a small porch with a roof at the entrance. Timber Log Cabins from Hallgate Timber, garden buildings, garden studios, home offices, summer houses. Hallgate Timber offer a wide range of timber log cabins including cabins from Lugarde Cabins, Logcabins.LV & Palmako Log Cabins. Hallgate Timber has been established since 1989, we a re a family business based in Long Sutton, Lincolnshire. Our cabin site is easily accessible from Peterborough, Cambridge, Lincoln, Norwich, King's Lynn, Boston, Spalding. We also make garden sheds and summer houses as well as our log cabin range of garden buildings. You can contact us on 01406 363978 Mon-Sat, we are closed on Sundays. All sizes are approximate, delivery times are estimates and building are subject to changes as we improve designs. Painting shown on products is not included as standard unless stated otherwise.